Pastor Joseph, at right with a parishioner, has been agitating for years to get the refineries to use local truckers. The shuttering of the post office in St. James Parish’s 5th District betokens the end of the African-American community that calls the area home. It is in the way of the sprawling Formosa plant to be built on 2,400 acres. The announcement that Formosa, a Taiwanese petrochemical giant, plans a $9.4 billion project in St. James Parish is being hailed as a big win for Louisiana and a sign of economic progress. Never mind that African-American communities in the immediate vicinity of the 2,400-acre site on the Mississippi River’s west bank will be damaged if not eradicated. That it’s being dubbed the “Sunshine Project” because of its proximity to the Sunshine Bridge is ironic, given the 28 million tons of air pollution it will add each year to the already smog-shrouded landscape known as Cancer Alley. This pollution includes chemicals that cause cancer, breathing problems, and chemicals that are warming the planet—and exacerbating flooding in Louisiana. The area proposed for the Formosa plant is currently sugar cane fields that abut the unincorporated African-American town of Welcome. A few miles down the road is Freetown. As the name suggests, Freetown was settled by men and women who survived slavery. For the last 75 years, small African-American towns like these have been wiped off the map by industry without the legacy their descendants deserve: compensation or even acknowledgement that they ever existed. Make no mistake, that’s what’s in store. 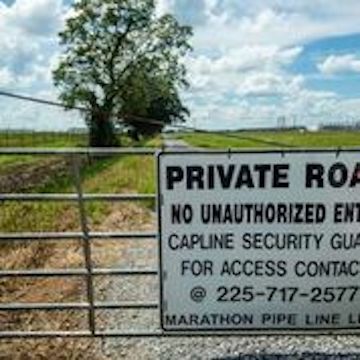 Formosa is the largest in a series of facilities, including the proposed Bayou Bridge Pipeline, that are surrounding these communities in St. James Parish like a python strangling prey. Welcome, Freetown, Burton Lane, Chatman Town and other hamlets comprise a census tract roughly equivalent to the 5th District of St. James Parish. The most recent census notes that 2,155 people live there. Eighty-seven percent of the residents are African-American. The median household income in the 5th District is $29,840—$37,000 less than in the majority-white 3rd District, just across the river. The signs of the 5th District’s impending demise are clear. The post office has already been shut down. Fifth District residents were told the reason was mold in the building, but a staffer at Democrat Congressman Cedric Richmond’s office said that the property was being sold by the owners, with no mention of mold. The shifting stories have residents suspicious, and they see the closure as a death knell. The mold story would be hard to believe in any case. 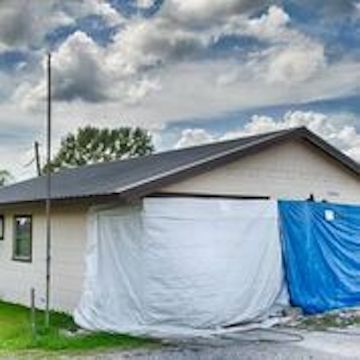 When have local, state or federal governments ever taken action to protect the people of St. James Parish from an environmental hazard? Mold? What about the known carcinogens in the air and water? Plants continue to pollute, residential property values plummet and industry slithers in as the buyer of last resort for African-American families desperate to sell and escape from the cancers, auto immune problems and respiratory ills that come with petrochemical contamination. According to federal data, the Mosaic Ammonia plant, Plaines pipeline company and seven other facilities in the area have had 51 accidents since January 2017. Sadly typifying the report are details such as these: “Caller stated they smell a significant amount of gasoline or other petroleum product in the air outside of a private residence… Caller was experiencing nausea and sickness.” Another resident complained of a rotten egg smell—a telltale sign of chemical exposure. The more credible explanation for shuttering the post office is that it’s part of a larger plan to kill off Freetown, Welcome and the entire 5th District. After all, if there’s no post office, there’s no town. Plants continue to pollute, residential property values plummet and industry slithers in as the buyer of last resort for African-American families desperate to sell and escape from the cancers, auto immune problems and respiratory ills that come with petrochemical contamination. They sell for a song, of course, an added dividend flowing to an industry that profits from pollution. This dynamic has played out all over our state, especially in towns up and down the Mississippi River where Formosa, with three major plants in Louisiana, lies in wait. It’s much cheaper to expedite the death of a town than to compensate people by paying a fair price for their homes and land. A gate and warning signs block access to a road needed as part of an evacuation route from River Road to State Hwy. 3127. The post office and pollution aren’t the only signs that these communities are slated for destruction. The road that 5th District residents relied on as an evacuation route from River Road to Highway 3127 was gobbled up by a pipeline company and turned into a dead-end street. And the Port Authority map of St. John Parish doesn’t even acknowledge the 2,000 residents who live there. The map shows existing industry and potential building sites for new facilities. Schools, churches and homes are not discernible from the aerial shot, and there is no legend identifying where they stand. The map was pointed out to me by local resident Eve Butler. “It’s like we aren’t even here,” she said. Formosa, on the other hand, is definitely here. The company has been promised significant state subsidies—a $12 million grant for infrastructure costs plus access to Louisiana’s Industrial Tax Exemption and Quality Jobs programs. Using natural gas as a feed stock, the plant will produce a variety of petrochemicals used in throwaway products that include plastic bottles and grocery bags. Let’s not even think about the folly of deepening the state’s commitment to petrochemicals, the principal factor in climate change and rising seas that threaten the well-being of no state more drastically than our own. Meanwhile, Formosa is forging ahead with a major public relations campaign as it lines up necessary permits. As the juggernaut rolls forward, only the parish council members representing the threatened African-American townships have spoken out — and they are easily outnumbered by their white counterparts. Fifth District Councilman Clyde Cooper has repeatedly brought up the need for an evacuation route for his district. Even this simple request has been parried, with empty promises but no solution. The communities are looking down the barrel of a gun pointed right at them. The sad truth is that project cheerleaders and elected officials including the governor have their finger on the trigger. The white political establishment is giddy about the Formosa announcement, pausing only occasionally to consider its responsibilities to the general public. “It becomes incumbent upon us to make sure we’re putting enough effort to get our residents ready for these jobs,” Parish President Timmy Roussel told the Advocate, the implication being that residents are not now ready. Up and down the river, industry crows about the good schools that its taxes make possible. If the petrochemical industry’s infusions to the tax base were such a boon to St. James Parish, why would local schools not already be graduating job-ready youth? Don’t hold your breath waiting for a change. Pastor Harry Joseph, at right with a St. James resident, has been agitating for years to get the refineries to use local truckers. Pastor Harry Joseph of the St. James H.E.L.P. Association has beseeched industry for years to engage local truckers to meet its transportation needs. There are men in the community who could do the job. But year after year, as new plants come in and old ones expand, 5th District residents are excluded. That dismissive attitude to the local workforce doesn’t seem likely to change. Project booster Michael Hecht of the New Orleans-based nonprofit GNO Inc. assumes the plant’s 1,200-employee workforce will come from as far away as Lafayette and Mississippi. The Advocate reported Hecht’s comments in an article noting that Roussel had received an offer to buy the parish’s youth detention center and convert it into a dormitory for construction workers. Given that African Americans were a key component of Governor John Bel Edwards’ gubernatorial election, you might wonder where he stands in all of this. Since the Formosa plant was announced, his office has received hundreds of calls on behalf of the 5th District. Among other things, residents and their supporters have begged the governor to step in and force creation of an evacuation route, something a state judge has already ordered but that the governor’s Department of Natural Resources has failed to act on. Clearly the “local elected officials and citizens” he’s talking to haven’t included community members threatened by pollution, leaks and explosions. The demographic in St. James is one that Edwards purports to care about: rural African Americans, many of them burdened by poverty. But at this point he seems to be pinning his appeal to them on a single accomplishment: “I expanded Medicaid!” We are expected to accept the obliteration of historic black communities because the governor expanded Medicaid. 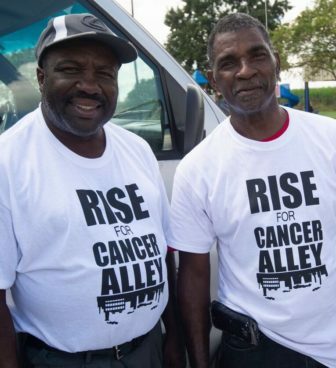 It is true that expanding Medicaid is a boon to Louisiana, but access to a doctor doesn’t get close to the root of Cancer Alley’s health crisis. It’s not enough to simply treat the disease. And what good does a doctor do when the conditions that doctor might eventually diagnose are terminal? What is happening in St. James is an old song in Louisiana: African Americans betrayed in the name of “progress,” a euphemism for giving industry a free hand and looking the other way as residents — and whole communities — sicken and die. Mossville, Sellars, Wallace, Sunrise, Morrisonville. These are some of the names of communities that have been wiped off the map as the petrochemical industry expands. A few of these towns wrestled some compensation from industry, but never for the health harms they suffered, and never for the loss of their historic land and their culture. What is happening to Freetown and Welcome and the other towns in the 5th District is obvious. The communities are looking down the barrel of a gun pointed right at them. The sad truth is that project cheerleaders and elected officials including the governor have their finger on the trigger. Anne Rolfes is founder and leader of the Louisiana Bucket Brigade.